The Labour Party candidate is 12 points clear of Gay Mitchell, with independents making major ground on the frontrunners. The Presidential field is becoming less crowded - with Michael D Higgins holding a major lead over the other three formal candidates. LABOUR’S MICHAEL D HIGGINS holds a 12-point lead in the race to become Ireland’s next president, according to a new opinion poll. The RedC poll, commissioned by Paddy Power, gives Higgins a 36 per cent share of the first preference votes – with Fine Gael MEP Gay Mitchell the best of the rest, on 24 per cent. Independent candidates have made good ground and are now within striking distance of their Fine Gael rival, however: Seán Gallagher commands a 21 per cent share of the vote, while Mary Davis accounts for the remaining 19 per cent. Strikingly, however, 33 per cent of respondents to the poll – carried out earlier this week – said they had not yet decided on who they would vote for, rejected all four of the current candidates, or simply would not vote. 19 per cent of respondents said they would not vote for any of the candidates, while 11 per cent said they could not decide which of the four current candidates to back. Voters aged 25-34 were the ones least likely to declare their favour for a current named candidate. Aside from his first-preference share of the vote, Higgins can also count on 21 per cent of second preference votes – meaning that he would eventually pass the quota and ensure election. Mitchell accounts for 20 per cent of second preferences, as does Mary Davis, while Sean Gallagher accounts for the last 15 per cent. 22 per cent of voters could not yet decide on a second preference candidate, while two per cent said they would only cast a first preference vote. The poll is the first mainstream poll to include only the four candidates who are assured of appearing on the ballot paper; the last comparable poll also included Gay Byrne, who led the poll, as well as Fianna Fáil MEP Brian Crowley who has since withdrawn his bid. If the four candidates’ share of the previous poll is taken by comparison, Higgins’ support has fallen by three per cent, while Mitchell has dropped one point. Gallagher’s share has remained unchanged, while Davis has gained the four points dropped by the two main party candidates. Gay Mitchell will take comfort from the poll, which shows his share of the vote in his native Dublin performing well – he now leads the field in the capital, with 34 per cent of support to Higgins’ 30. Higgins, a native Galwayman, leads in the Connacht-Ulster constituency, with the support of 39 per cent of voters, while Mayo woman Mary Davis is next on 25 per cent. Higgins also polls strongly among younger voters – with 44 per cent of voters aged 18-24, and 43 per cent of voters aged 35-44, saying they would vote for the current Labour Party president. Gay Mitchell and Seán Gallagher performed well among voters aged 25 and 34, with Gallagher recording 30 per cent of those voters support and Mitchell securing 29 per cent. 63 per cent of respondents said they believed having an elected president was important, with younger voters – who are unlikely to have voted in a presidential election before now – most likely to respond this way. In other matters polled by Red C, 55 per cent of voters said the State should provide debt forgiveness only on the basis of means-testing and if mortgage holders had a proven inability to repay, compared to 16 per cent who said none should be provided at all. 17 per cent of respondents said the State should provide debt but only for those currently in arrears on mortgages and loans, while 12 per cent said a blanket forgiveness should be applied to all people. 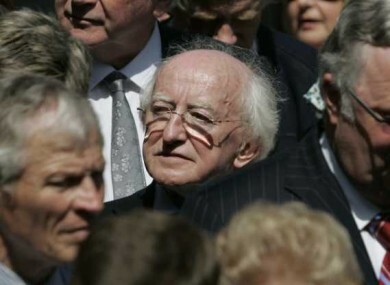 Email “Higgins holds commanding lead in latest Áras opinion poll”. Feedback on “Higgins holds commanding lead in latest Áras opinion poll”.